Download free trial to see if it works for you. Say goodbye to paper timesheets. Keep track of all your employees time electronically. You'll save time and money by utilising the in-built automation capabilities of TTN. Secure login for each employee. Multiple entries (shifts) per day. Simple time entry now with clock on/off. Track time and costs spent on projects. 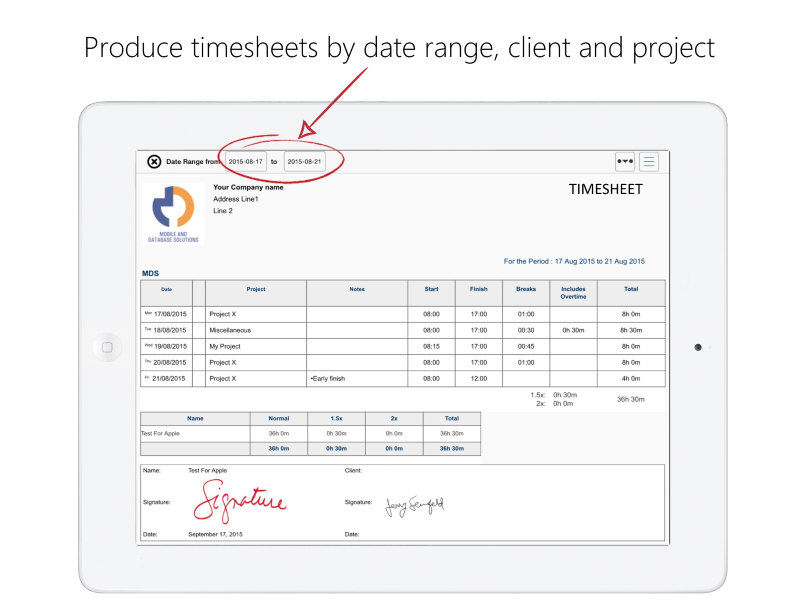 Create PDF timesheets with dual signoff. Track expenses and take photos of receipts. Submit time that can be viewed by your employer. Option to check in location. Web portal for administrator (using Firefox,Safari,Chrome browser). Simple and intuitive user experience. Enter multiple entries per day against Client and Project. 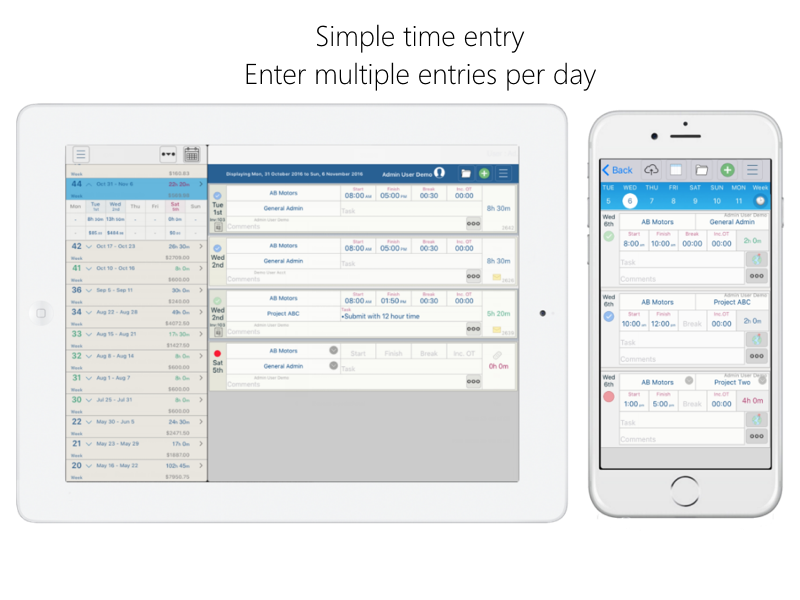 Enter hours worked as Start/Finish times or as Durations (normal, time half or double time) (Durations available for iOS app only). Email timesheets as PDF with dual signoff by yourself and your client. Option to automatically calculate overtime based on the limits you define for normal and time half. Annual leave, sick leave or Living Away From Home. Secure login with two security levels, admin and general user. Admin user has full permissions to create/edit all users, clients and projects and view and approve submitted time. General users have limited access. They can view clients, projects but can not create or edit and cannot view financial information. Basic financials with charge out rate/hr for projects and cost/hr for employees. No need for an internet connection to create entries (submitting time requires internet connection). Business or standalone premium licence required. This is an administrator tool to access all your data on your PC/MAC using your internet browser. Create and edit users,projects and clients. View and approve time entries. Produce and export reports as CSV. Timesheet report shows all time worked for the selected date range. Generate reports by selected date range. Specify weekly, fortnightly or monthly reports. Client report with option of dual signoff. Includes a swag of reporting templates with drag n' drop interface, so you can modify fields to be displayed. Track total hours, billable hours, cost, charge out, net difference (cost less chargeout) by project, client, user. Reports can be viewed in various formats such as tables, line charts, bar charts. All data is exportable in csv format so you can further analyse using spreadsheet software. Reports and charts can also be emailed. Generate Invoices by selected client,project and date range. 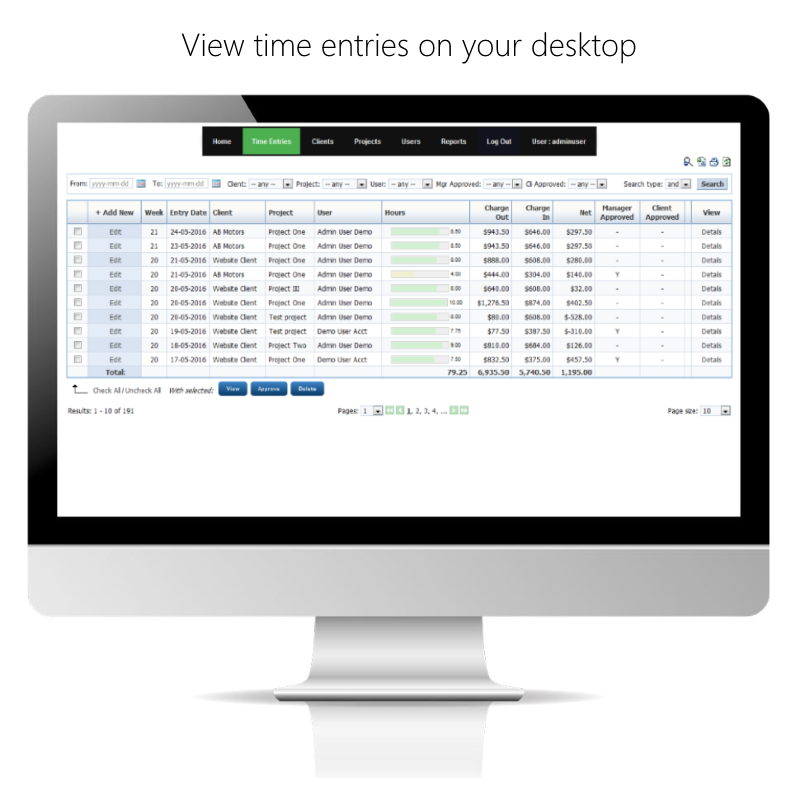 Amounts are automatically calculated using project rates x hours. Invoices can be emailed as pdf. All Subscriptions are per user for 12 months. For a discount on bulk user purchase please contact us. 3 License types available to cater for businesses or individuals. 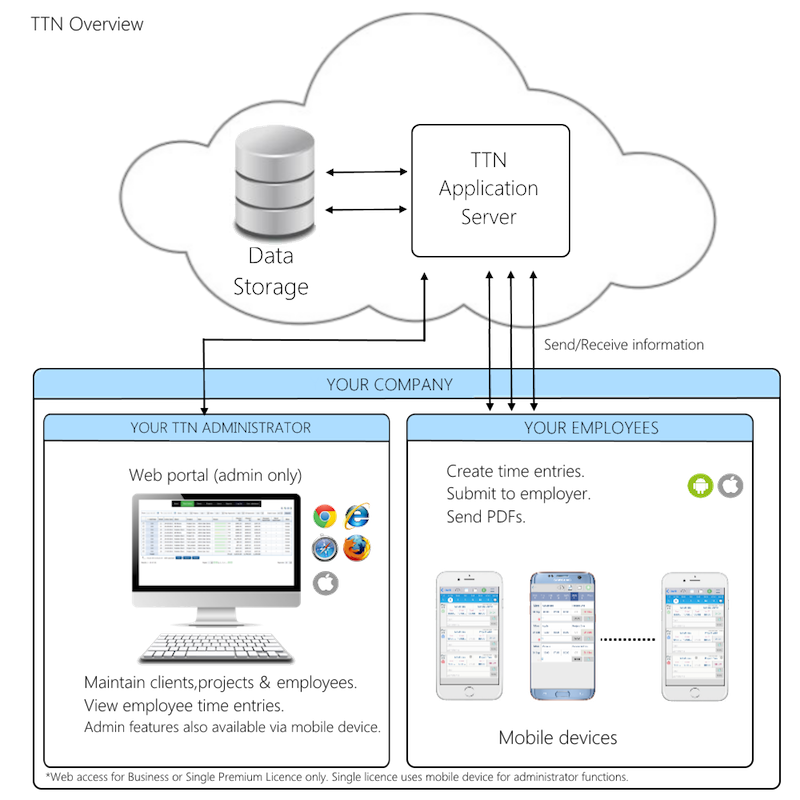 Keep track of your staff with TTN Business. Employees can submit time from the mobile app. Use the web tool to view all your employees time, and configure the app. Includes access to web reporting tool. This license type is recommended for individuals. Time entries cannot be shared between users with this license type. No access to web reporting tool. This license type is recommended for individuals. Time entries cannot be shared between users with this license type.